With strong support from Hudson Bay Mountain through reduced pass rates, our U6-10 entry level program is the ideal way to be introduced to a great sport. Our club focus on Canada Snowboards (CSF) Long Term Athletic Development LTAD. Riders will be introduced to basic riding techniques and skills, develop the ABCS (agility, balance, coordination, strength/speed) in as many different snow conditions and on as much varied terrain as possible, including free riding, gate training, Snowboard-X and Slopestyle. 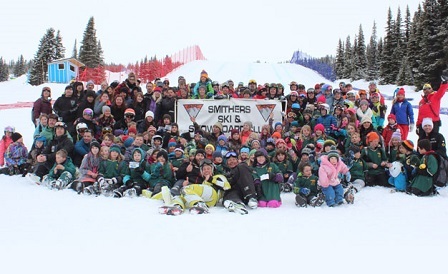 Founded by Canadian Olympic ski champion and shredder Nancy Greene, the Smithers Ski and Snowboard Club U8-10 program is the “FUNdamental” stage for our youngest skiers. With strong support from Hudson Bay Mountain through reduced pass rates, this entry level program is the ideal way to be introduced to a great sport. As a professionally directed racing program, the Smithers Ski Club strives to promote the sports of alpine skiing and snowboarding by enabling all if its members the opportunity to reach their full potential.